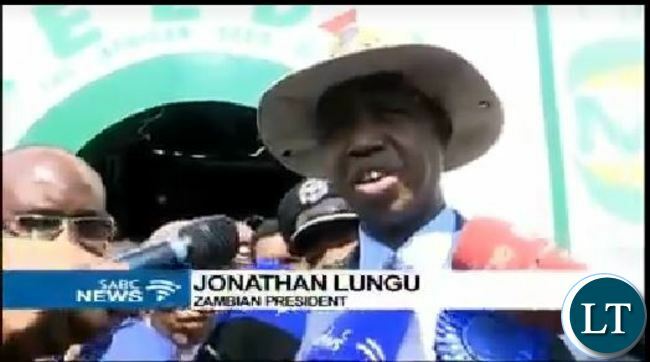 PATRIOTIC Front (PF) secretary general Davies Mwila has demanded an apology from South African Broadcasting Corporation (SABC) for referring to President Lungu as Jonathan Lungu on Saturday. Mr Mwila says it is regrettable that a media house of the calibre of SABC could allow such a mistake to pass, which he says is an insult to Zambia and the President. “SABC, like any other media house, has names of presidents on their fingertips,” he said. Mr Mwila said as much as mistakes can be made, SABC could have made a correction immediately after making it, hence the need for them to unreservedly apologise and retract their reference to President Lungu as Jonathan Lungu. This is according to a statement issued in Lusaka yesterday by PF media director Sunday Chanda. That is an insult to all Zambians not just PF, we demand an apology from SABC however let’s not make a big thing out of nothing- mistakes do happen but an apology is needed! I think the reporter should be arrested. Our President is very sensitive to this kind disrespect. Kikikikiki ati Jonathan… Not even close to Edgar or Chagwa. This is hatred. And what is audio says? Edgar has been on SABC news ever since, so this nickname means something. Kikikiki. PF is a very petty party. They worship their god lungu. They should also ask Museveni to apologize for calling him “EDWARD” lungu. How come the mentor mu7 was not asked to apologize for the “EDWARD”. This Mwila together with Tuesday Chanda & PF bandits demand is useless. People are tired of this nonsensical PF demands which are in themselves undemocratic & unlawful. In 2014 the words “I have no vision for this country” were truly spoken by visionless Lungu. Democracy has been overtaken by Dictatorship. The commonwealth & others are on the “throats” of PF bandits. Just release HH & the presidential petition must be heard~simple. Ok, Jameson Lungu – now what hey! Jonathan or Edgar what does it matter? They are both Slave names so they can be criss-crossed this way and that. We apologize for calling Chisamba Lungu Jonathan. It was an honest mistake by our chief editor Maimane Zuma. He wanted to see if there is dictatorship in that ca’untry. What apology? Just move on Jonathan Golden Teeth Lungu….worthless…. Jonathan sounds cool though than Cellphone Banda or Technology Bwalya, Funny northern Rhodesia names, anyway let’s go to shopping mall to ride escalators….. Hahahaha…Trevor Noah nailed it. Yes, SABC Should Apologise To The People Of Zambia Only And Not To Pf First Then Zambians Like Mr Mwila Is Putting It. LT Has Hidden Something Here. The Part Where Mr Mwila Questioned How SABC New The Full Names Of Hh And Failed To Know The Full Names For Lungu. So That Part Spoiled Everything Because It Simply Tells Me That Pf Where Jealous About SABC Knowing The Full Names For HH. So The Motive For The Demand Of That Apology Is Wrong Hence Its Not Necessary. Just Move On. Even Museveni Called President Lungu ‘Edward,’ Tell Him To Apologise As Well. Could it be because of the “Hat” our President wore? He looked like Goodluck Jonathan…could this be? It’s easier to remember African names like HH than the English ones like John, Jack , James. Stick to exotic African names and people will not forget you . Being paranoid is a big issue, can make you think the whole world is against you. For SABC Hakainde Hichilema is proper African names than Edward, Edigger, Jonathan Lungu. Those demanding apology from SABC should first apologise to Zambians for putting them in a state of emergency needlessly. Apology for what? That is a name befitting Kamwendo. Here we do not offer apologies, we can call Zuma anything. Apology for what?One can be mistaken called by someone’s name.Ba Mwila Tuchawa twanu nitoipa.Try to work accordingly for the promotions you are looking for.Shame!